Mary Jane Canyon hike is an 8.7-mile hike along streambed in a canyon that narrows to less than 100 feet wide with walls to almost 200 feet tall. At the turnaround, there is a double spouted waterfall caused by a large wedged rock splitting the water’s flow. Sylvester homesteaded at the mouth of Professor Creek in 1886 and Sylvester Richardson, formerly a professor, opened a store, a school and a post office at this site. In 1890, when Grand County was formed he became the first county commissioner. Mary Jane Richardson and her husband’s legacy live on in the naming of Mary Jane Canyon and Professor Creek. 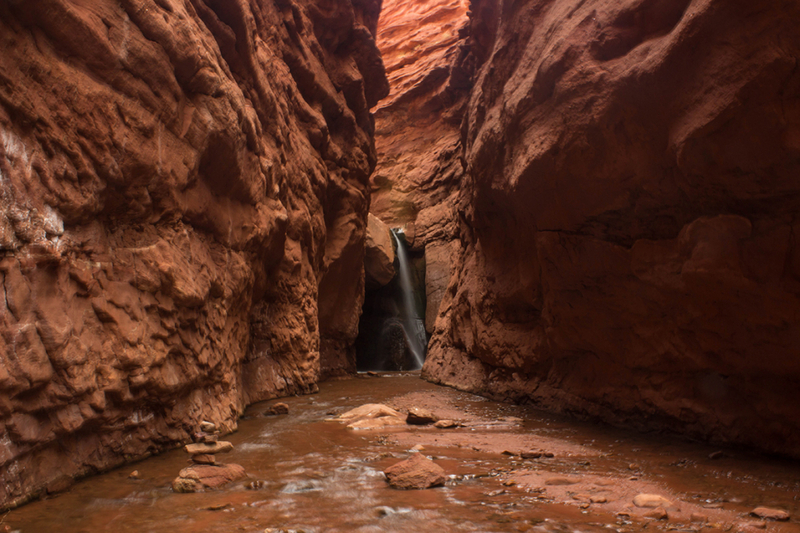 This hike goes up an active stream bed into a canyon that grows deeper and narrower before the hike’s turnaround, a double spouted waterfall. Much of the activities in the Moab area are dry and baking in the sun. This trail offers water, steep canyon walls and water that can be treated for drinking purposes. On a hot day, walking in water is an option and standing under the waterfall at the turnaround a joy. Do not hike this trail or any other drainage during precipitation. 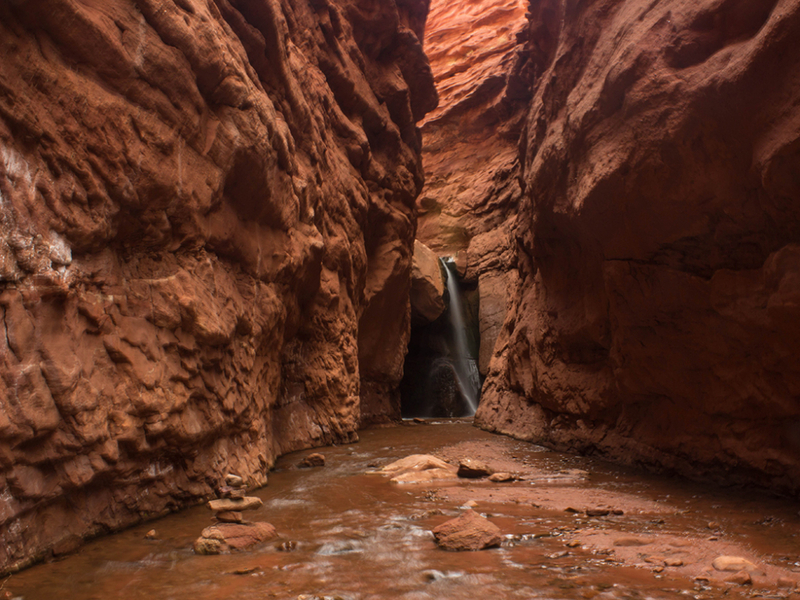 Flash floods in enclosed canyons are a serious consideration not to be taken lightly. This trail, a streambed, is not one of Moab’s less traveled hikes. There is not really a trail to follow, just keep going upstream. The waterfall at the end will precipitate turning around. It is a gentile, flat walk with little elevation gain. As the walls of the canyon climb 100-200 feet tall and the trail narrows to 10-20 feet wide there is always something to look at. As this is an out and back hike, everyone will love it as you can chose your distance. It’s prefect for a family outing with children or a hike with someone you want to chat with as you can walk side by side for much of it. For the seriously fit who can walk 8.2 miles this is a great outing. The trail follows an active streambed that originates in the La Sal Mountains to the south and joins the Colorado near the turn off to the trailhead. This area is rich with history and you will find this to be one of Moab’s quieter trails. It is perfect as a first hike on your way in or last hike on your way out of Moab if you are coming from the east along River Road. From Moab, drive north and take a right onto 128, known as River Road. Go 18.5 miles and turn right onto Ranch Road, it is a dead end. The trailhead is a little over 2 miles in after an active ranch. Please drive this road slowly and be considerate of the ranch. From there, follow the river southeast into the canyon. There are no fees and the parking is free as this is BLM land. Dogs are allowed on this trail.